Price, speed, and a new, more stable chipset make second gen Ryzen a tempting offer. Excellent CPU performance in demanding tasks, competitive gaming performance, and a mature platform make Ryzen 7 2700X AMD's best current processor. AMD's CPU prospects underwent a massive change last year with the release of the Ryzen family of processors. Today, just over a year after the initial launch of Ryzen 7, AMD is ready for round two. Using an improved 12nm manufacturing process and promising higher clockspeeds and improved performance compared to last year's models, the new Ryzen 7 2700X is the jewel in AMD's crown. It also comes with a reduced launch price compared to last year, effectively taking the place of both the 1800X and 1700X. Add to this an improved X470 chipset and mature motherboards that eliminate of the teething pains that plagued the first gen parts, and AMD gets the trifecta of performance, pricing, and reliability. But is it enough to topple Intel's Coffee Lake processors from their top spot? That depends on what you're planning to do with your PC. Ryzen 7 initially offered double the core and thread counts of Intel's Kaby Lake parts, effectively forcing Intel to move beyond the 4-core limit that has been hobbling the mainstream Core i7 and i5. Coffee Lake required a new motherboard and chipset, but it also put the definitive exclamation point on mainstream performance. That's what the Ryzen 7 2700X has to contend with. There's a lot with the Ryzen 7 2700X to talk about, but if you want to skip straight to the gaming performance, click here. If you missed any of our previous AMD Ryzen reviews, the Ryzen 7 launch review is a great place to start, with performance of the 1800X, 1700X, and 1700. Ryzen 5 came next, followed by Ryzen 3 and then Ryzen Threadripper, and earlier this year AMD launched the first Ryzen APUs with the 2400G and 2200G. Also related are the reviews of Intel's Core i7-8700K and Core i5-8400, the top two picks for gaming CPUs. For straightforward buying advice, here's our guide to the best CPU for gaming. Second generation Ryzen processors, aka Zen+, aren't simply a clockspeed increase over the first parts. AMD has moved to GlobalFoundries's improved 12nm LP (Leading Performance) manufacturing process, which AMD says improves transistor performance by 10-15 percent compared to the previous 14nm node. But AMD also tuned the design to improve latencies, with a reduction of 11-16 percent for L1, L3, and DRAM latencies, and a 34 percent reduction in L2 cache latency. Combined, AMD says this improves IPC (instructions per clock) by around three percent over the original Zen architecture. That might not seem like a lot, but it's better than Intel's Skylake to Kaby Lake transition (which was only a clockspeed bump thanks to the 14nm+ enhancements). 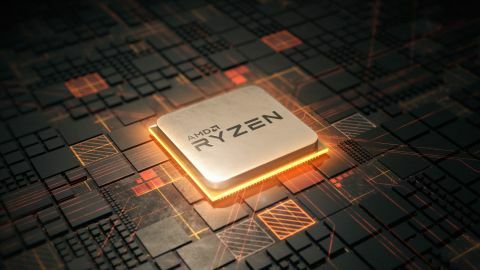 AMD also improved the turbo speeds and algorithms for the second generation Ryzen parts with Precision Boost 2, so lighter workloads will more frequently run at the maximum turbo clock, and midrange and heavy workloads will also see higher clocks. Typically, that means about 300-500MHz higher clockspeeds at all loads, and with the reduced per-core power use at the same clockspeed, AMD says we should see a net overall improvement in the range of 10-15 percent. Finally, let's quickly talk about the X470 platform changes. First is what hasn't changed, which is great compatibility: all the X470 motherboards continue to use socket AM4 and are backward compatible with existing Ryzen CPUs. The opposite is also true, and existing motherboards with a BIOS update will all support the Ryzen 7 2700X and other new Ryzen processors. But X470 isn't just a renaming of X370. AMD has improved the power infrastructure on the chipset, and I was able to run every single Ryzen CPU in my possession with DDR4-3400 CL16 memory without a hitch on the X470 boards. That's a big deal, considering a few of the processors previously wouldn't do more than DDR4-2800. The other change isn't something I've had time to test just yet, but AMD now has StoreMI as a value-added feature for X470. It's free, it works with any storage device, and it provides smart SSD caching of your hard drive. SSD capacities up to 256GB are supported (for the StoreMI cache), another 2GB of DRAM can be used for an even faster cache, and the main data drive can be up to 32TB. I'll be taking a detailed look at StoreMI in the coming week or two, to see how it fares compared to pure SSD storage as well as Intel's Optimus Memory. As with all previous Ryzen processors, the Ryzen 7 2700X is fully unlocked. AMD says all-core overclocks of 4.2GHz are typical, and the Ryzen Master overclocking software has been improved to allow per-CCX module clockspeed adjustments, but it's still a bit more limited than Intel's approach where you can set clockspeeds by CPU core usage. I'll be looking more at overclocking next week, but in practice I've found overclocking of the latest Intel and AMD processors—especially the top models like the 2700X and 8700K—is becoming less important. The Ryzen 7 2700X runs at close to 4GHz with every workload I've tested (3925MHz minimum), and sacrificing the benefits of AMD's SenseMI and Precision Boost 2 for a gain of only 275MHz doesn't strike me as particularly important. This is good news in that you get nearly maximum performance with no effort, and the Ryzen 7 2700 should be the better choice for overclocking (it's cheaper and has lower starting clockspeeds), but today I'm looking at stock performance. I'm also using stock cooling, where applicable. One thing worth going over again is the memory speed. AMD shipped a kit of G.Skill Sniper X DDR4-3400 CL16 memory for use with the Ryzen 7 2700X and Ryzen 5 2600X (which I'll be reviewing separately, though the numbers are in the charts here). I used the A-XMP profile and the Gigabyte and MSI boards both ran that speed without any difficulties. What's important to note is that AMD gets more help from higher RAM clocks than Intel, because on Ryzen the RAM clock also sets the speed that's used for all communications between various CPU elements, the chipset, memory, and more. Going from DDR4-2400 to DDR4-3400 can improve overall system performance by 10 percent or more, depending on the application. For this review, I've tested the Ryzen 7 2700X and other Ryzen processors using Gigabyte's Aorus X470 Gaming 7 WiFi board. I have X470 boards from Asus and MSI as well, and I'm going to look at the three main contenders next week. Initial results show only minor variations in performance, so your motherboard choice will largely come down to features and aesthetics. Price is also a factor, though all the X470 boards right now are premium models and are priced accordingly. The list of current test platforms and hardware is up and to the right, and I've been retesting all (yes, all!) of my CPUs with the latest drivers, firmware, and applications. That includes the Meltdown and Spectre patches for Windows, which in some cases cause a modest drop in performance. I'm omitting a few processors for now, as testing isn't complete, but all the major current options are present along with most of last year's models, plus a few other extras like the i7-4770K and i7-965XE. The single Core i9-7900X is provided as a point of reference for the extreme users, and I'm working on a larger CPU roundup article where I'll discuss some of the changes in benchmarks, but everything here is current as of April 2018. The problem I ran into is that many of the applications I use for benchmarking have been updated multiple times in the past year, and the earlier results were no longer valid, so I had to press the reset button and start all over. All the current Intel test systems use fast DDR4-3200 memory to provide optimal performance, with M.2 NVMe SSD storage for the OS and applications, and games stored on a large 2TB SATA SSD as a secondary drive. Older systems may use DDR4-2666 (X99) and DDR3-2133/1600 as appropriate, along with SATA SSDs for the OS where necessary. For the graphics card, I use a GeForce GTX 1080 Ti Founders Edition running stock clocks. This provides for maximum difference in CPU performance when looking at games, while slower GPUs like a GTX 1070 would narrow the gap. Since this is PC Gamer, I'm starting with the gaming performance results. This is an area where Ryzen has been a bit weaker than Intel's chips, and RAM and cache latencies were fingered as the primary culprits. With second generation Ryzen parts improving cache and memory latency, plus higher clockspeeds, there was hope that AMD could close the gap, and Ryzen 7 2700X does better than the 1800X by about five percent. That's good, though AMD still doesn't claim a single (meaningful) win over the i7-8700K. Does that really matter? It depends on what you're doing with your system. If you're running a more modest graphics card like a GTX 1070 or RX 580, performance with most of the tested CPUs will be virtually identical. If you're running at 1440p or 4k, you'll also push the bottleneck from the CPU to the GPU. Even without those qualifications, few people would really notice the difference between 100 and 110 fps. There are a few games where the difference between the 2700X and the 8700K is as much as 20 percent, and plenty of others where it's less than 10 percent. Overall, Intel's 8700K has a 10 percent lead in average fps and a 15 percent lead in minimum framerates. AMD is even more competitive this round, but Intel's i7-8700K and i5-8400 are still a bit faster. If all you're doing is playing games, on a clean system without a bunch of extra utilities and other junk running in the background, Intel's 8th Gen processors win. But what if you're not just playing games? Workload becomes a lot more important when discussing pure CPU performance, and while multi-threaded workloads are available, the number of those that people use on a regular basis is limited. I've updated my 7-zip benchmark to compress and decompress files to more accurately simulate real-world loads. To help illustrate performance differences, I've created two aggregate charts. The first, shown by default, is the multi-threaded CPU scaling. This chart is the geometric mean (equal weighting to each result) of the Cinebench nT, H.264, H.265, VeraCrypt, and y-cruncher scores. The second chart is more of a look at the full spectrum of CPU performance. It includes all the individual CPU tests, like Cinebench 1T and 7-zip, plus the Civilization VI AI benchmark, average gaming performance, and average minimum gaming performance. If you look purely at multi-threaded benchmarks, Ryzen 7 2700X just edges past the Core i7-8700K. The gap is larger if you run applications that don't benefit a lot from AVX instructions—so H.265 and y-cruncher favor the Intel chips more, while H.264 and Cinebench favor Ryzen. At best, the Ryzen 7 2700X is about 25 percent faster than an i7-8700K, and at worst the i7-8700K is up to 20 percent faster. Switch to the full picture that includes gaming along with single-threaded and lightly-threaded workloads, and core counts don't matter quite as much. Ryzen 7 2700X ranks third out of the tested processors, with only the significantly more expensive i9-7900X clearly distancing itself from the other chips. This is intended as the global view of CPU performance, so take that as you will. What's the final verdict for the second generation of Ryzen processors? They're clearly an improvement in every meaningful way over the first gen parts. Higher clockspeeds, improved latencies, and lower prices—these are all great things to see. But what really sells me on the latest Ryzen processors isn't just the improvements to the CPU, but to the platform as a whole. Jim and I wrote last year about the state of the AM4 platform not long after the initial launch, and early adopters of Ryzen experienced plenty of pain. Memory compatibility, instability, reset BIOS options, and plenty of quirks remained a serious concern for months after the first Ryzen processors shipped. I'm pretty sure I had more problems with AM4 motherboards in the past year than with all the Intel motherboards in my possession from the previous five years combined. Or maybe it just felt that way, and having multiple boards fail contributes to that feeling. That's why I'm super happy with the X470 boards so far. They just work. Ideally that's the way it should always be, but most new platforms have some growing pains—Ryzen wasn't alone in that respect. I haven't had one inexplicable BSOD or crash with the X470 boards so far, and the only time I've had to go into the BIOS is when I swapped CPUs (which is something you always need to do). It's early days still, but the two weeks of testing for Ryzen part two was mostly without complications **. That's the maturity that you get from a platform that has been around for a year. X470 is a refined version of X370 with StoreMI thrown in as a bonus. If you're looking for a processor that offers good gaming performance and excellent multi-threaded performance, Ryzen 7 2700X is arguably the best choice. If you're a gamer first and do CPU intensive tasks like video editing as a secondary task, or maybe not at all, and if you're running (or planning to run) a top-tier graphics card like a GTX 1080 Ti, then Intel's Coffee Lake CPUs get the nod. It's worth pointing out that the Coffee Lake CPUs like the i7-8700K and i5-8400 also beat Intel's more expensive Core i9 line when it comes to gaming, while the 2700X is only two percent slower in games than the i9-7900X. I give more weight to gaming performance, which is why the Ryzen 7 2700X rates a bit lower than the i7-8700K, but both CPUs are excellent choices. And having choice is part of what makes PC gaming such a great hobby.